A sticky subject to say the least as I believe that too many people are too quick to throw a name on a plant that only is slightly different than a previously named plant of a like species. 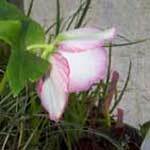 However, with Hellebores, it's a different ball game as vegetative propagation is excruciatingly slow at best. With the successes of Tissue Culture that is changing. Having almost 60,000 stock plants in the ground has given us the edge in selecting worthy hybrids that merit mass propagation. We've started a program to select the 30 best plants every year and put them in TC. We plan to have between 3000-5000 of each in 18-24 months and keep the pipeline full from that point ad infinitum. We chose our first 30 in early 1999. Most are now in TC or getting ready to go under the knife. I had fully intended to photograph each one and run a contest on the Internet for the Gardening Public to name them, however, things got out of control as they usually do in the Spring and I only managed to capture 5 on film. So, here they are. H1 Inner -- This clone is exhibiting the genetics for "doubling". The reason for the quotes around the word doubling, is due to vagary of that word. You have to understand a few things about this complex of hybrids that we are dealing with. 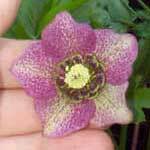 # 1, the colorful floral parts that we are viewing in Hellebores of this type are not really petals, they are sepals. The petals are in the center of the flower surrounding the anthers and are aborted. These structures are referred to as nectaries. In this clone and similar clones, the nectaries are beginning to become petaloid and to take on the colors of the sepals. The term double would not really apply as there are still sexual part of the flower present. More on this subject later. 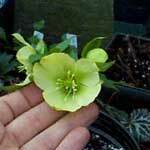 H2 Inner -- Probably one of the most desirable and difficult colors in Hellebores is a good yellow. This is mostly due to the fact that yellow comes primarily from Helleborus odorus and in my opinion, this is a weak grower. H3 Inner -- One of my favorite traits is spotting. With thousands of different spotted clones, it's difficult to pick a favorite. This is a good, uniformly-shaped flower with a very clear, pure white background and nice even spotting on all five sepals. 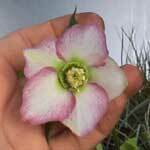 H4 Outer -- There are very few complaints about Hellebores, but probably the one that I hear the most is regarding the pendulous nature of the flowers. So here's the perfect answer to that grumble, color on the outside of the flower, and picotee at that! The inside of the above shows a pure white background with a beautifully picoteed edge, slowly fading as it heads toward the center of the flower. H5 Inner -- Wow! This has to be one of my all time favorites. The deep rich color, the velvety appearance, the near perfect shape of the flower, the the the - well I'll let the picture speak for itself and you can describe it in your own words. 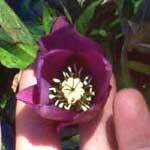 Helleborus 'Thanksgiving' -- I just noticed this plant in the garden on Thanksgiving day 1999. It was in full flower. Extremely early for this type of plant. I've seen flowering this early in past years, but the flowers were always misformed and I assumed that they were seasonal variations. 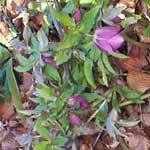 Helleborus 'Thanksgiving' -- These flowers seem perfectly formed and I will mark this plant to evaluate it for flowering time next year. Hopefully, it will be a consistent early bloomer and since the flowers are attractive, well-shaped and carry a nice, rich, deep color, be worthy of naming and putting it under the knife for release to the waiting masses. Stay tuned to this channel for further updates.